All right, it’s been a while since my last post. 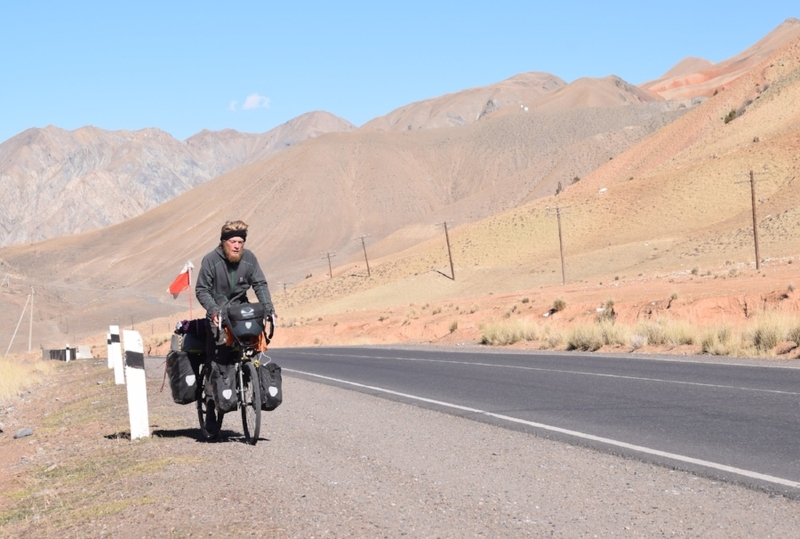 As I left Osh in Kyrgyzstan, I was well aware that I would be facing some of the most physically challenging days of my trip so far. Osh was freezing cold, but I was going up a lot higher. I was going up to Sary-Tash, which is a small town just at the edge of the Pamir-mountains. The first couple of days went all right. The hills were relentless though, and my knees were taking a beating. Combined with camping in – 10 temperatures in the night, I was feeling quite miserable on the third day. Eventually my knees gave in, and I had to get a lift for the last few kilometers in to Sary-Tash. I finally made it there, and was then looking forward to half a day of relaxing before moving on towards China. This, was when I was first introduced to the Chinese. I was given a very spacious room in the guesthouse I was staying at, but after sunset, I realized that I was to share it with a whole bunch of Chinese truckers. Don’t get me wrong, I love cultural difference. But there are certain parts of the Chinese culture I’m having a very hard time embracing. Being stuck in a room with 10 Chinese truckers all farting, burping and slurping away, meant I had a not so relaxing night after all. Even throughout the night they were all being very loud. One guy was watching Netflix on his phone at full volume till 4 o’ clock in the morning, and no one seemed to mind. Anyway, I got up early the next morning to start making my way towards the Chinese border. I was riding above 3000 meters that entire day, and was even nearing 4000 at the highest point. It was a relatively short day, but once again, very exhausting. I made it to the Chinese border in the afternoon that day. I went up to the guards on the Kyrgyz side, got stamped out, and made my way through no man’s land. Eventually, I made it to the Chinese side of the border. To my surprise, they were closed for the day… So there I was, stuck in between borders in the freezing cold. A few trucks were stuck as well. One of the truckers asked me if I wanted to come stay in his truck for the night, and so I did. The wind was really rough, and there was really nowhere around to camp. At this point I was absolutely starving. I hadn’t had anything to eat all day, and food had been sparse the previous couple of days as well. Needless to say, I was all out. As we were sitting in his truck, the hunger got so bad that I had to ask him if he had any food I could have. The language barrier was pretty bad, so it took me a while to get the message across. It was quite embarrassing asking for food from a stranger (and quite the eye-opener) but he gladly fed me, and we went to sleep. His heater was broken so it was a pretty cold night, but at least I was not exposed to the wind. The morning after I began the process of entering China. I was entering the province of Xinjiang, which is notorious for being very heavily militarized. It is extreme. I’ve never seen anything like it. Every singe Item I owned was inspected and measured in different ways. Every photo I’ve taken was studied, and several pictures (x-ray and regular) was taken of me and my stuff. I was constantly being stopped to have my documents checked, and it even came to a point where the police started following me as I was cycling. They wouldn’t let me stop for 2 hours. 30 hours after being stamped out of Kyrgyzstan, I was stamped in to China. The police checks kept going throughout my visit though. Kashgar was quite enjoyable, and probably the biggest culture-shock of my entire trip so far. Most countries tend to flow into one another, but China was like a cultural wall. You expect it to be somewhat like the central-asian countries, but with the Chinese government moving Han-Chinese and their culture to Xinjiang, it’s becoming more and more like eastern China. I was able to find a few authentic west Chinese experiences though, such as the Kashgar Livestock Market. Though the handling of the animals is a bit rough (read: very rough), it is a beautiful mix of ethnicity from throughout Central Asia. As I set off from Kashgar, it was time to go up even higher than I’d previously been. I was now riding the Karakoram Highway. The military presence was much less as I got up into the mountains towards Pakistan. For the most part, the slopes were gentle, and the temperature surprisingly mild. It was probably some of the most enjoyable riding of my trip so far. It was exhausting though, as I was hauling my bike up to 4200 meters. I made it to Tashkurgan (bordertown with Pakistan), and was then forced on a bus by the Chinese authorities once again. As I made it to Sost in Pakistan, I checked in to a guesthouse and started speaking with a few locals about the situation in Islamabad. They told me about violent protests, and that one of the Taliban leaders had just been killed in Rawalpindi (twincity of Islamabad). Of course, I was bit concerned as I then started heading towards Islamabad. The Pakistani side of the Karakoram was even more impressive than the Chinese side though. The peaks were higher and steeper, and fresh snowfall combined with the colors of autumn made for unreal scenery. I cycled for a couple of days, but eventually had to get on another bus due to visa-reasons… I got the bus from Gilgit to Islamabad. It was a 22 ride, on a very old coach. Though not the most comfortable (or safe) it was a really cool experience. The Karakoram Highway is extremely prone to landslides and rockfall, and since it had just been raining for several days, large portions of the road were affected. Machinery cuts way through the landslides, but leaves a narrow bumpy road. At one point we drove past a particularly steep cliff, and the driver stopped the bus at the narrowest part of the road. Everyone came to the window to look down into the river far below us. “what are we looking at?”, I asked. Another of the passengers told me that a bus had fallen down into the river just a few days earlier, killing over 20 people. Slightly unsettling. The driver was listening to deafening Punjab music the entire way as well, presumably to stay awake. Eventually we made it to Islamabad, and all my fears were immediately put to shame. Islamabad is a very modern city with lots of parks, wide streets, and western shops. Not exactly what I had been imagining. It’s a cool place though, and I’ve enjoyed exploring the city. As I’m writing this, I’m still stuck in Islamabad waiting for my Indian visa. I haven’t been cycling now for 9 days, and probably won’t be cycling much for the next two weeks either, since my father is coming to see me in India in a few days. Really looking forward to exploring India with him before I get back on the bike. That’s it for now. The fundraising has been going really well since last time! There’s been quite a few offline donations that haven’t yet been added to the fundraising page, but we’re pushing 20,000 DKK (about 2700 euro) Let’s keep it going! Thank you to everyone who has donated so far, or otherwise helped spread awareness. Donations can be made through the link below.